Thanks to Fi from Mumma Morrison for sharing with us her daily diary of how she felt during her first week of starting to feed her little man solids. Fi’s son is known on her blog as Starfish. It’s lovely to remember the first feelings associated with what a big milestone this is in your motherhood journey. One of the many lessons you learn in giving your child self-help skills, learning the importance of embracing mess and the first contemplations about your own feeding skills. For more information on starting solids, talk to your GP / a feeding specialist / paediatrician / dietitian / health nurse and consult the most up-to-date feeding research. For Australian residents, you will be pointed to the ASCIA guidelines for starting infants on solids by feeding experts. These were last updated in July 2016 at the time of publishing this post. You will notice changes in introducing allergens in alignment with current research. 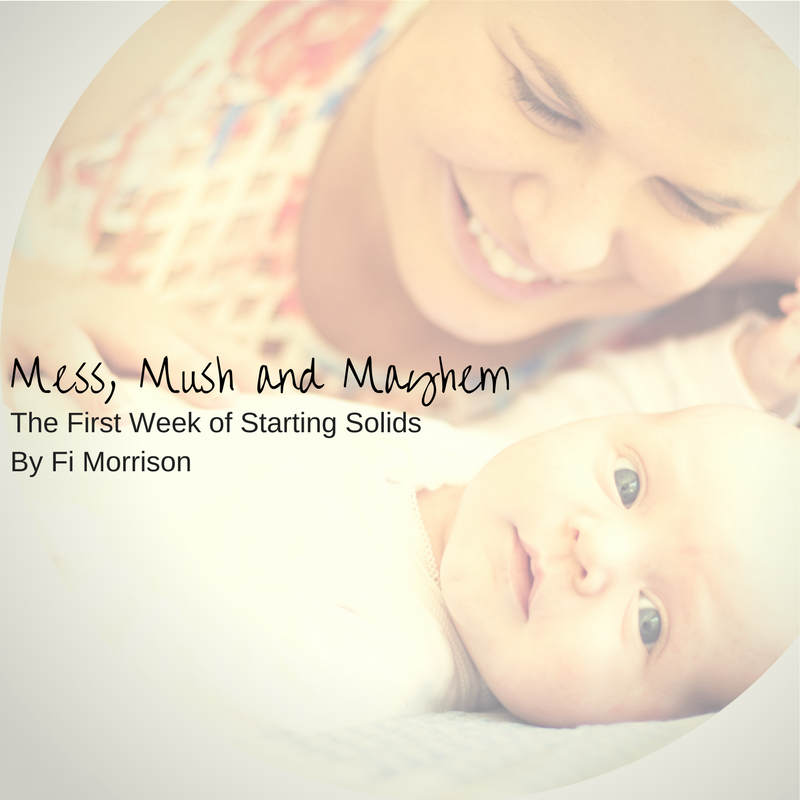 I was recently asked by Simone to share my experience of starting solids with my 5 month old son, after she wrote a guest blog post about introducing solids to babies on the Mumma Morrison Blog, “Why does everyone tell me something different when it comes to starting solids?”. I decided that the best way to document it was to write it a bit like a diary – that way I could not only explain the practical bits and bobs, but also share a bit behind the thoughts and feelings of this BIG change. I hope you enjoy and may find it useful for your own experience. I sat my boy down for his first solids meal with both a sense of excitement and trepidation. What would it be like? How would he like it? How messy would it be? We decided to start with apple purée as we’d read it was a good food to start with (despite later reading debates about the introduction of veg vs. fruit first – fruit apparently leading to possible ‘sweet tooths’…). As our son had his first bite, and munched (sipped? Gummed?) happily on the purée, we felt a sigh of relief, and I was absolutely loving it. I loved watching his little pudgy face munching away on the food. To be honest, I wasn’t surprised he took to it so well – he had downed panadol and the rotavirus oral syrup before, so I assumed he’d eat anything. Today was another day of change – firstly, we increased Starfish’s meals from 1 to 2. He now had lunch (an hour after the breastfeed) and dinner (an hour before his bedtime routine). We also introduced him to the Pear and Prune purée. We waited a couple of days to make sure he wasn’t allergic to the apple. We also introduced the new food at lunchtime (not dinner time) in case he was allergic so we were awake to attend to him. Again, Starfish lapped up the meal. The realisation of constant mess has begun to settle in – mess all over him (as he shoves his hands in his purée -filled mouth, then rubs his eyes, his hair, your clothes), mess all over you (as he sneezes on your face with all his purée -y goodness). All in all, another successful day. Today seemed to be a day of reinforcing our new routine. Starfish has been learning what it means for him to sit in the bumbo, have his bib put on, and when the spoon starts to reach towards his face. He is learning to sit more upright (he leans forward in anticipation of food – what a guts!! – and then stays leaning forward to eat), eat properly off the spoon and is showing signs of wanting more. The Pear/Prune and Apple purée were repeated at the two meals. Today went like clock work. This was it. The day where we went into full solids mode. Starfish is now on 3 meals a day, and we also introduced him to carrot (his first full veggie meal!). This may have been a mistake while friends were over, because they are now witnesses to the day our son was stained orange. He literally had carrot EVERYWHERE. I put him down for nap time with orange still around his nose because it wouldn’t come off! His bib was stained, Everything was stained! (Luckily his nose didn’t stay orange). By the time we got to the dinner feed though, my husband and I were feeling a bit more like a well oiled machine. DAY 6 – FEED, CLEAN, SLEEP, REPEAT. Today was much the same as the day before, except slightly less carrot stains on the face, and we are all learning how to better navigate feeding time. Family win! My husband and I have been fairly certain that our son will eat anything. He has lapped up panadol before, as well as the rotavirus oral vaccination syrup (the doctor said she’d never seen a baby have it so quickly!). So I felt confident feeding our son broccoli, despite my husband’s disdain of it and the fact it made our house reek for hours. I was even more confident because it was mixed with breastmilk. At lunch time, as we sat down for his meal, we eagerly watched his expression to see how he’d take it (we’d been videoing every reaction he’s had to different foods so far!) it took a few mouthfuls before he realised he didn’t actually like it! This was also the first day he actually started to get fussy in the bumbo – arching his back and whinging. Now it’s a two-person job to get him out of the bumbo (bless his chubby little knees! ), so by this stage I was starting to panic about my husband returning to work tomorrow and me taking on the role of feeding on my own. We had to change back to the apple we were feeding him, and we had to finish his feed on my lap. The dinner freed returned to normal, but I was a bit anxious about the following day. Well I did it. I begun/continued what would become Starfish’s and my new routine. I did what all mothers do – you just ‘do it’. When he fussed in the bumbo (which has become a bit more common), I managed to get him out by myself. I prepared the purées, heated then, fed our son (on my knee if I had to), cleaned up his face, hands and hair (as well as my own), the bumbo and all surrounding surfaces, and got him ready for his sleeps. * It takes a LOT of effort – preparing purées, washing, cleaning extra bowls, utensils, and so forth. * There is a LOT of MESS – so many extra bibs to clean, faces and hands to wash, and containers and spoons to clean. 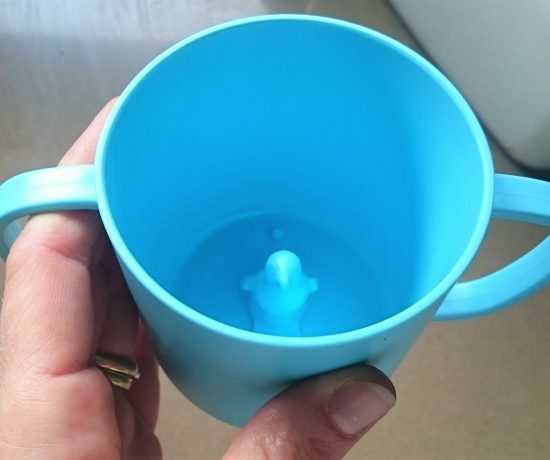 * I need to be prepared prior to mealtimes – I have to keep my son entertained for the 5 minutes it takes to prepare his meal (reheating frozen purées, getting a new bib, etc). 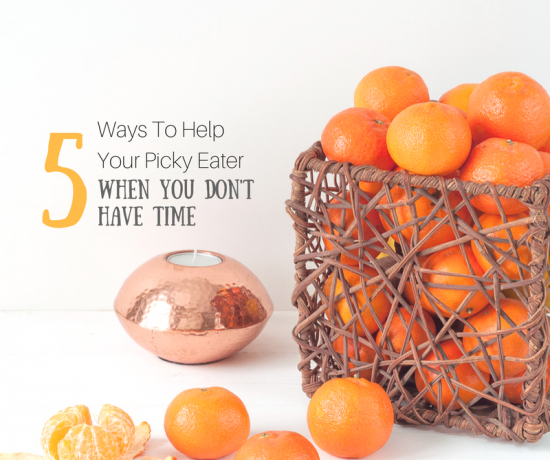 * I need to manage my time – I need to make sure I have enough food for my child on any given day. I keep getting towards the end of my frozen stash before realizing I have to duck down to the shops to buy more fruit and veg to make more purée! Thanks Fi for sharing. Starting a feeding journey with your kids is also a huge lesson in your own perceptions, anticipations and eating dynamic awareness. I loved reading about Starfish’s first foray into the big world of learning to eat. Go Starfish! How was your first time starting solids with children? Did it throw your routine? Did you get “too much” well-meaning advice about it all?